With many different hair loss causes to consider, it's important that you have intelligent hair restoration specialists on your side. That is why so many people come to the team at True & Dorin Medical Group. With offices in New York City, Long Island, Boston, and New Jersey, we've been able to help many patients along the East Coast with their hair restoration surgery needs. We've received a number of questions from current and prospective patients about the effects of anabolic steroid use on hair growth and hair loss. Let's look into this issue in a little more detail right now. Does using anabolic steroid really cause hair loss? Even though some sites about male body building may claim otherwise, one of the side effects of anabolic steroid use is the loss of hair in varying degrees. The primary cause of the hair loss from anabolic steroid use has to do with the hormone dihydrotestosterone (DHT). DHT is one of the primary hormones involved in male pattern baldness. When a person takes steroids, this accelerates the production of DHT and the amount of DHT in that person's system. This higher level of DHT causes the hair loss to occur. In general, balding from anabolic steroid use occurs if a man already has a genetic predisposition for balding. Anabolic steroids simply speed up the process given how it affects the hormone levels in the body. 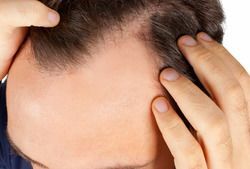 Men who do not have a genetic predisposition for hair loss may not experience balding from anabolic steroid use or may experience milder levels of hair loss. Steroid use can lead to hair thinning or hair loss in some women as well, so it's important to keep this in mind. All of these serious health issues should serve as compelling reasons to avoid using anabolic steroids. Treating the hair loss caused by anabolic steroid use may sometimes involve non-surgical methods. If a person stops taking steroids, hormone therapy may be able to help balance out the chemical levels in the body and promote some hair regrowth. This varies from patient to patient, of course, and the genetic predisposition of the patient can have a bearing on overall effectiveness of this line of treatment. If non-surgical treatments are ineffective at reversing the hair loss caused by steroid use, surgical hair loss may prove ideal. We'll be sure to discuss these matters with you in greater detail during the consultation process so that you can make a well-informed choice about your options. For more information about treating hair loss and how we can help you achieve a full head of hair that looks natural, it's important that you contact our hair restoration specialists today. The team at True & Dorin Medical Group will work closely with you so that you receive the treatment you need to meet your hair restoration goals.